Summer is coming! Learn to paint a vibrant floral design. 1. Polish nail with Gelish Give Me a Break Dance. 2. Apply Gelish Black Shadow to the corner of the nail and blend with a small striper brush to create an ombre effect. 3. Use Gelish Arctic Freeze to paint one flower with five petals, and a few other petals in the corner of the nail. 4. With Daler-Rowney watercolors, mix red and yellow to fill in the petals. 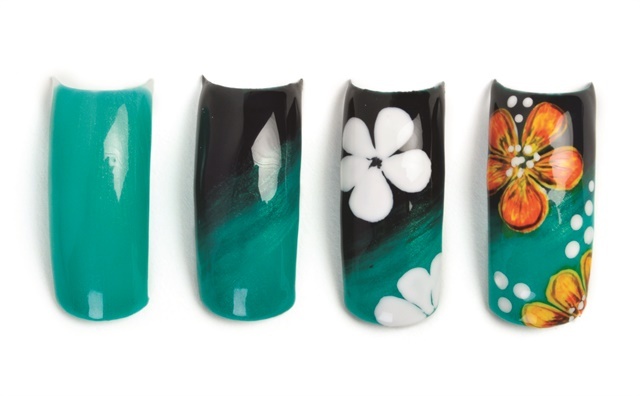 Use Gelish Black Shadow to add lines to the center of the flower and around the petals for detail. Paint white dots randomly around the nail. Apply top coat.